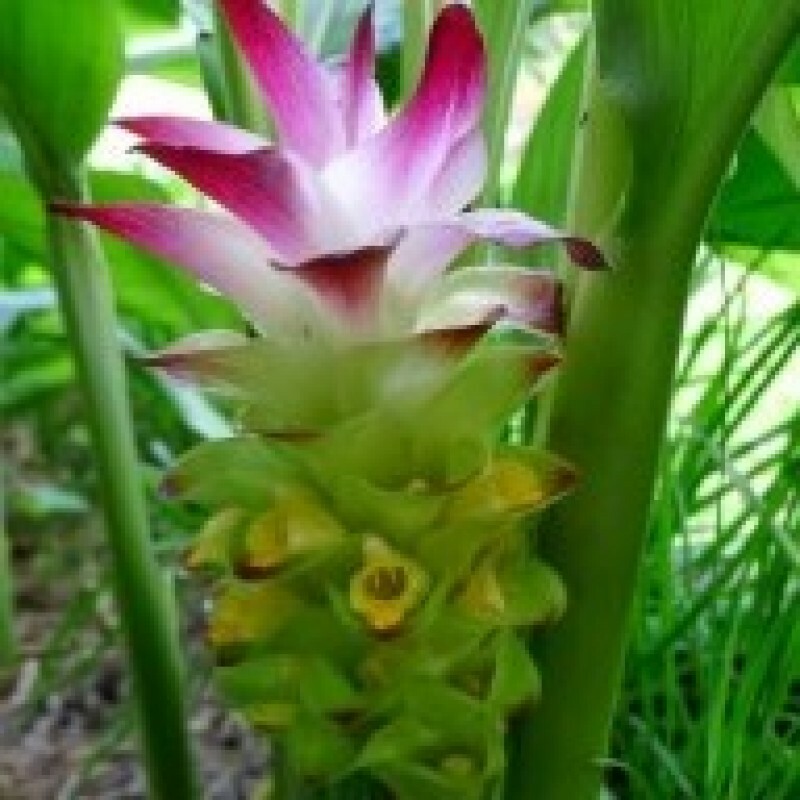 Curcuma caesia, black turmeric or black zedoary is a perennial herb with bluish-black rhizome, native to North-East and Central India. Black turmeric is also sparsely found in the Papi Hills of East Godavari, West Godavari, and the Khammam districts of Andhra Pradesh. The rhizome of black turmeric has a high economic importance owing to its putative medicinal properties. In west Bengal, the rhizome of the plant is used in Kali Puja, and hence the plant is called Kali haldi. By etymology, Kali is the feminine form of Kala, which means black color and hence the plant is termed as black turmeric in English. This species has been regarded as endangered by the central forest department of India due to biopiracy. The rhizomes are used as a rubeficient to rub the body after taking a Turkish bath. In Bengal, it is used in the fresh state-turmeric. The rhizomes of the herb are often used by the Baiga, Sahariya, Agariya, Gond, Korku, and other tribal communities of Mandla, Balaghat, Chhindwara, Anooppur, and Dindori district of Madhya Pradesh state for the treatment of pneumonia, cough, and cold in children, and for fever and asthma in adults. In northeast India, the powder of rhizomes is used by tribal women as a face-pack during their engagement and marriage period. Fresh rhizomes are crushed and applied as a paste on forehead for relief from migraine or applied on the body for sprains and bruises. In Lohit district of Arunachal Pradesh, Kanti tribes apply fresh rhizome paste on snake and scorpion bites . The rhizomes are claimed to have a property of acting against leukoderma, epilepsy, cancer and HIV/AIDS. Gondi people of Bastar apply rhizome paste on the hydrocele using betel leaves. Intake of small amount of rhizome paste is claimed to expel gases from stomach and cure menstrual disorders. The cultivation and harvest practices are similar to that of common turmeric which is used in recipes. In the fields, the rhizomes are washed thoroughly and are placed in a wide mouthed cauldron. The water is poured in the cauldron such that the rhizomes are completely sunk. The cauldron is covered with a lid, and the rhizomes are boiled for about 30 minutes until foam oozes out with strong odour. The rhizomes are taken out whilst the water is reduced to one-third of its content and when they turn soft with their inner portion decolorized from blue to dark or pale brown. The rhizomes are then dried in hot sun for 10 to 15 days until they are hardened. These dried rhizomes are then packed for marketing.